alaTest a collecté et analysé 10 avis de consommateurs et d'experts pour le produit Sony UBP-X700. La note moyenne du produit est 4.5 sur 5, tandis que les autres produits de même catégorie ont une note moyenne de 4.0 sur 5. En moyenne, les consommateurs notent ce produit 93/100 et les experts notent ce produit 80/100. Schon Sonys UBP-X800 überraschte mit einem moderaten Preis. Jetzt gibt es mit dem Sony UBP-X700 einen neuen Preiskracher. Wir haben den Test. "Came well packaged and extremely easy to set up. 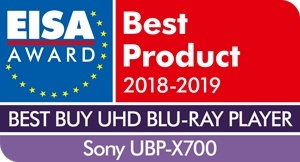 Still to try out the range of disc standards but my 3 year old DVDs work well Very happy "
"I ideally only needed a Blu-ray player that also played dvds but the fact that I can also use it to access streaming sites like YouTube etc means I don't have to change channels all the time. " "Excellent product - highly recommended. Smooth and fast operation." "Sony has never disappointed All I wanted I got,thanks "
"Nope I just wanna was the day is nope finally got a new blue ray player in. CBBC digital"